The slice is from the first lot of the qualification run of 64K DRAM's on 125mm. Slices run on the Miho MOS 1 Front End. This slice lot completed processing on May 20, 1982. The lot represented by this slice was used to prepare a qualification sample to secure approval of Miho MOS 1 125mm. 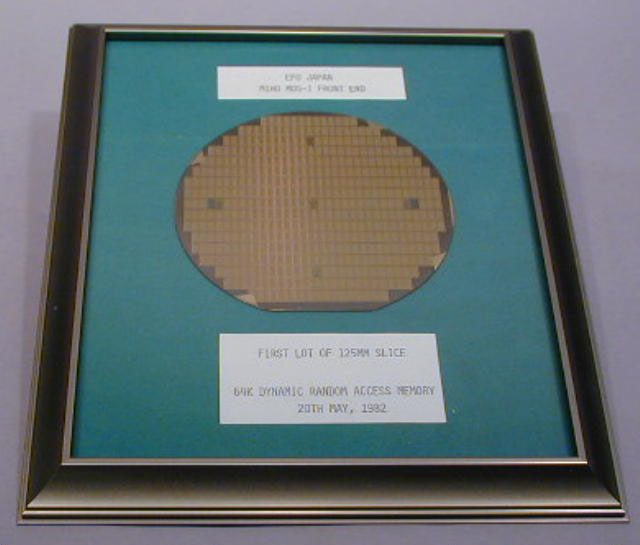 slices with 64 DRAM chips for production use. The six special chips on the slice are test chips to be available for slice evaluation purposes. Placing such chips on slices has been standard TI procedure. The TI 64K DRAM developed at TI's Stafford (Houston) plant. Initial slice processing was done in the Lubbonck Front End. The device was announced in September, 1978, with samples available in the fourth quarter of 1978. For additional information, see Press Releases in the Artifact Historical File. Related material in collection: G00330.